My love of pocket palettes began in the early summer of 2012. I was preparing to visit France and was enamored with the idea of painting Paris. But being very new to watercolors I wasn't sure how to travel with them. A friend mentioned using an Altoids box for a palette, and as I started looking for options I fell into the world of pocket palettes! These wells are bigger than full pans! That summer I made my first palette and it went to France with me stocked with very cheap student watercolors. I sat in parks sketching statues with it and there painted the first watercolor painting I was proud of. Now I know how huge the wells were, but overall I loved the thing. While I've since seen great tutorials ranging from using empty half-pans with magnets to soldering wells into the tins* this construction was easy to construct in an urban apartment and I didn't have to order any supplies. *This tutorial has since been removed. Mixing area as extra "lid"
The wells and mixing space were shaped with SculpeyTM polymer clay inside the tin and baked there according to directions. After cooling, I painted the wells and mixing area white with acrylic paint to help seal the clay and to make the colors more visible. With use, the mixing area detached from the lid. Instead of gluing it back, I found that it fit well as an extra "lid" over the paints. After three years of use the tin is beginning to rust in a few places, but given all I've put it through a little rust doesn't seem like much. After finding USk Chicago, I upgraded to a 24 color Field Kit of Koi watercolors made by our sponsors Sakura. It is a great kit with little details that really take it up a notch! (If you've been wanting to try one, be sure to join me for Supply Speed Dating at the seminar in July.) But I'm always looking for ways to change up my sketch kit. Last summer just before the seminar, I learned a new mix for skin tones and wondered how my sketches might change if I mixed all my colors. I planned to rework my Altoids palette but was too busy painting to think about a layout. That's when I noticed the eyeshadow box I was about to throw away. After cleaning out the remaining makeup, I had eight empty slots about the size of a half-pan! I painted the inside of the lid with clear gesso to make it a better mixing surface and put in my colors. At less than half the thickness of my tin it is truly pocket sized! I used this palette for all my sketches at last summer's seminar, but latter added in two other slots for variations in my primaries. When I just go out with my smallest watercolor kit, I choose this little palette and a water brush. It even fits in the tiny pockets of women's dress pants! But as always, I'm still looking for a better pocket palette to carry with me. Right now I'm considering making a trip to the Chicago Public Library to make a 3d print of this insert for a pocket palette. Have you tried making a pocket palette or even several? 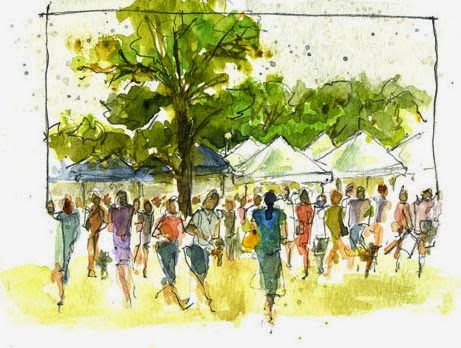 What makes a watercolor palette ideal for your urban sketching? What's the smallest palette you've ever worked with or seen? Often in urban sketching we focus on the architecture or landmarks we encounter to tell the story of our surroundings. There are times though, when we add people to the scene, even when they’re not the focus. They add an element that can make it easier for the viewer to connect with our visual story. People give scale, energy, life, and an invitation into the scene. When you need or want an extra spark in your landscape or cityscape including people can be the trick you need. 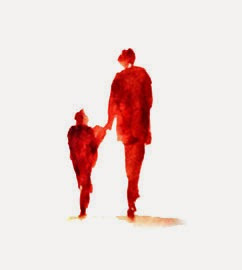 In this post I give you tips for using watercolor to add figures to your work. There are many approaches for quickly adding figures to watercolors. I use a combination of two different methods – carrots and rectangles. Both ways employ similar mind sets. The result from just four strokes, a simple basic figure! Repeat the process and add a little embellishment. Now try playing with just slight changes to the gesture and size of the carrot shapes. Add more, create a crowd or a parade! character of a place, through it's people. 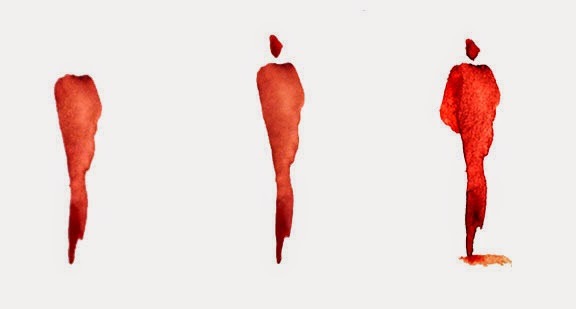 Paint a group of carrots and rectangles together. Let a few overlap and let the paint mingle. What happens when the head stroke touches the shoulder line? When it doesn’t? Experiment, add line to emphasize or embellish some of the shapes. Try adding just a little detail. Would you exercise and sketch at the same time? Many moons ago, I had heard a lot about how you should do little exercises while you are stuck in commuter traffic–whether it be on a bus, train, airline or especially in your car with stop-and-go traffic. So it made me think, with all of the hours I spend sitting in a chair or at my desk urban sketching ideas or observations, should I be exercising while I sketched? I decided to do a little research on some simple exercises. “Calisthenics” are a form of exercise consisting of a variety of exercises, often rhythmical movements, generally without the use of equipment or apparatus. They are intended to increase body strength, body fitness and flexibility with movements such as bending, jumping, swinging, twisting or kicking, using only your body weight for resistance. When performed vigorously and with variety, calisthenics can benefit both muscular and cardiovascular fitness in addition to improving psychomotor skills such as balance, agility and coordination. Cool, there seems to be a common thread here that I wanted to explore further. 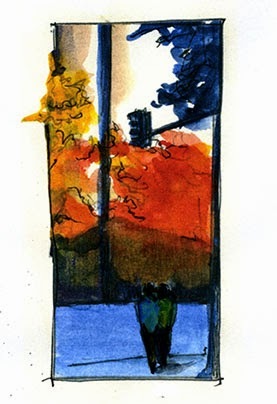 I want to be remembered as the first Urban Sketcher who creates a series of simple exercises that can be done during sketching, especially at a two-day event such as the upcoming 2015 Urban Sketchers Chicago Sketch Seminar #uskchicago2015. Here are a few of the exercises that I have developed (with a little help from my personal trainer). Give these a try and let me know what worked and didn’t work for you. Disclaimer: I am not remotely qualified as a physical trainer or therapist. Please consult your physician to determine if a regular exercise regiment is recommended or will even help your sketching technique. If you find that your sketches have significantly gotten worse, please discontinue any exercise until you consult your physician. Note: Don’t forget to pause for a drink of water as needed. Sit Up Sketching: Grab your sketchbook and pen, lie down flat on your back with your knees bent, and do a normal sit up towards your knees. When you reach the upright position, place your sketchbook and pen on your knees and draw a few lines of what is in front of you while you hold this position. Then allow your torso to slowly fall back towards the horizontal position and repeat 10 times or until your sketch has been completed. Sketch Push-ups: With your body in a horizontal position, push yourself up so that your body remains rigid with your arms fully supporting your torso and lower your body with both arms at alternating intervals, holding your body in the up position for 1 minute and lowering for 5 seconds. Sketching is best accomplished while you are in the upper position. Repeat until your sketch is complete. Sketch Planking: With your body in a horizontal position, push yourself up so that your body remains rigid with your arms fully supporting your torso. Your sketchbook and pen should be directly under your drawing arm. You may have to shift your weight over to your supporting arm while you sketch with your free arm. Sketch quickly while you shift your attention from your subject matter to your sketchbook. By the time your supporting arm starts to fatigue, you should be wrapping up your sketch. Approximate sketch time: 10 minutes. Lunge Sketching: Stand in view of the object you wish to sketch and take a big step forward and bend your knees as shown. Place your sketchbook on your lap and begin sketching the subject in front of you for as long as your legs will support you (perhaps 30 seconds will be sufficient). When you start to feel fatigue set into your legs, stand up and rest for 10 minutes while you sketch. Then repeat the lunge again for 30 more seconds. Repeat until your sketch is complete. Alternative Wall Sit Sketching: Stand in front of a brick wall, half wall, fence or fire hydrant with your sketchbook and pen in hand. Bend over slightly into a sitting position until your knees are at a 90º angle. Place your sketchbook on your lap and begin sketching the subject in front of you for as long as your legs will support you (perhaps 30 seconds will be sufficient). When you start to feel fatigue set into your legs, stand up and rest for 2 minutes. You may choose to sketch while standing up during this rest. Then repeat the wall sit again for 30 more seconds. Repeat until your sketch is complete. Bench-Step Sketching: This exercise is a derivative of the box step and step platform exercises. In this version, approach an empty half wall or bench (preferably without someone already sitting on it) and either step upon or hop onto the bench. Select an object to sketch, raise your arm cradling the sketchbook and begin sketching. Jump down safely off of the bench and back up at regular 5-minute intervals. Not recommended if you have bad knees, back or ankle issues. Sketchabout: With your sketchbook supported by your arm positioned at a 90º angle, place your pen over your sketchbook and begin walking and sketching simultaneously. This is the same activity that people will perform while walking and texting on their phone except that you will be exercising your observation and drawing muscles. Peddle Sketch: With your sketchbook supported by your arm positioned at a 90º angle, place your pen over your sketchbook and begin biking and sketching simultaneously. This will require great balance and multi-tasking as you focus on your ever-changing subject matter, the motion of moving your legs in a cyclical fashion, torso movements to maintain balance to steer the bike “hands free” and build your observation skills. Perhaps practice this in an empty parking lot while cycling before co-habitating with other vehicles.